I recently learned about WPRB, Princeton University's student-run radio station (103.3 FM) through a notice about a recording of my Trumpet Sonata being part of a month-long series of programs dedicated to music by women hosted by Marvin Rosen. You can listen to the station on-line through this link. Marvin Rosen's "In Praise of Women" program airs tomorrow from 5:30 a.m. to 11:00 a.m. Eastern time, which makes it pretty early for people in other time zones. 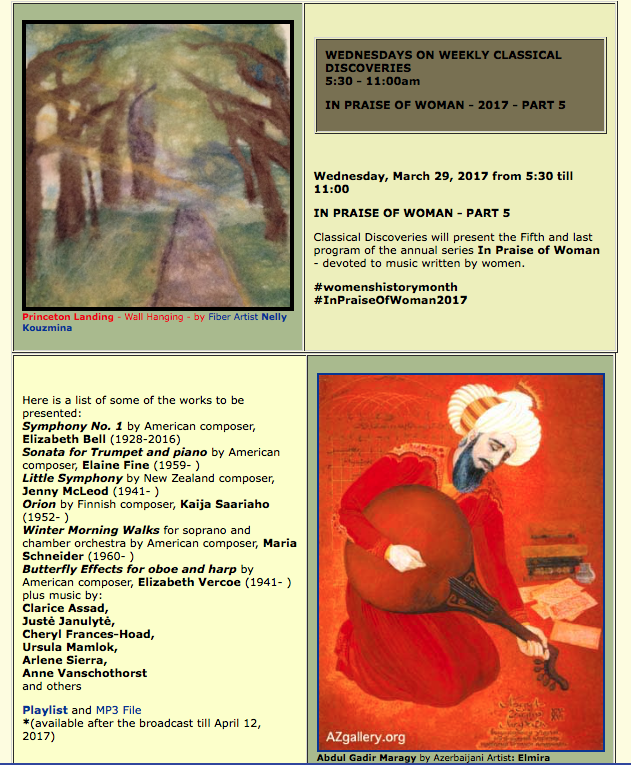 Fortunately this and the other four programs of music by women will be archived until April 12. You can find the programs through this link. Here is tomorrow's schedule. 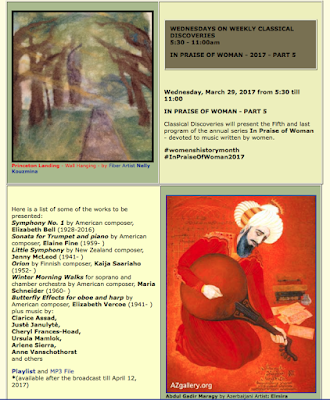 This and the other programs in this series provide a tremendous resource for people interested in learning more about music written by women. Indre Viskontas, the neuroscientist-soprano who hosts the "Inquiring Minds" podcast about science in our lives, has started a new podcast devoted to music and the mind called Cadence. It looks (and sounds) promising, so I thought I would share information about it here. I have listened to the first of three new episodes. There will be many more to come. In celebration of the season! 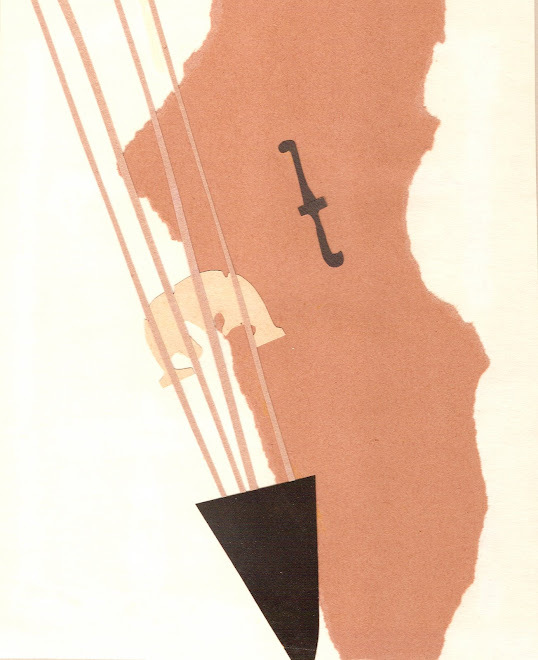 You can get the music (for free) on this page of the IMSLP. I guess that creative outlets change from time to time. For years and years I put a great deal of creative energy into composition. I found a crazy fulfillment from writing. It was the first thing I wanted to do when I woke up in the morning, and I would put off other tasks in order to work out ideas. I even enjoyed working out ideas and then discarding the product. I did put time and energy into trying to become a better violist and a better interpretive musician, but not having to attend to the physical production notes on an instrument in real time is a great "ladder of escape." When you write a piece of music it is usually another person's responsibility to make it sound good. It is also another person's responsibility to determine what it "means." Lately I have been getting intense enjoyment from playing old notes and old phrases written by people I probably never would have met had I been alive when they were alive. I really get a kick out of figuring out how I want phrases to "go." It is as if some switch has been turned. I still have the skill to write, but lately I prefer to devote my time to listening more carefully and becoming a better player. The music running through my head these days is mainly music written by other people (sometimes it is music that I am arranging, but more often it is music I am practicing). And I feel oddly at peace. I sometimes ask myself if I am still a composer when I am not in the process of writing something. I also wonder if I am less of a composer because I tend to neglect the business-related things that composers have to do in order to have my music played. The answers to these questions don't matter at all. It is simply a pleasure and an honor to be able to be a full participant in musical life, even when it is physically exhausting. I can't think of a better way to spend my days.